The Kongma Sakyong concluded his annual winter practice intensive, or puja, Sunday evening at the Kalapa Court in Boulder, Colorado. This year’s pujas were devoted to Kurukulla, a feminine deity renowned for magnetizing prosperity, and Vajrakilaya, one of the most powerful practices used to overcome obstacles. The Sakyong performed these two practices in order to benefit the world, nurture the strength of the Shambhala community, and fulfill the requests of more than 1,400 people who had asked the Sakyong to practice for themselves and others. 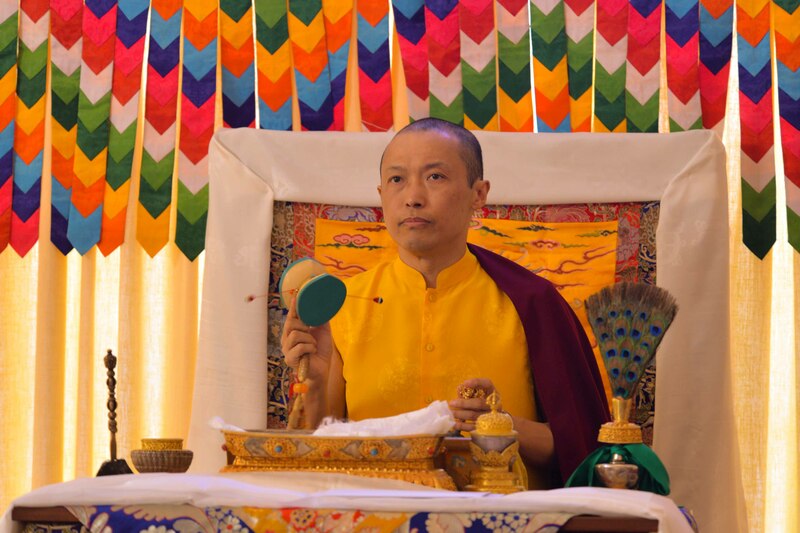 During remarks at the event, the Sakyong emphasized gentleness during the Kurukulla puja and bravery during the Vajrakilaya puja, two of the most essential qualities of the Shambhala teachings. The pujas were conducted at the residence of the Sakyong and Sakyong Wangmo. Each practice session was attended by more than fifty guests, including the delightful presence of Jetsun Drukmo, Jetsun Yudra, and Jetsun Dzedron who seemed completely joyous to have the pujas in their home, which had been transformed into a Shambhala monastery for the weekend. 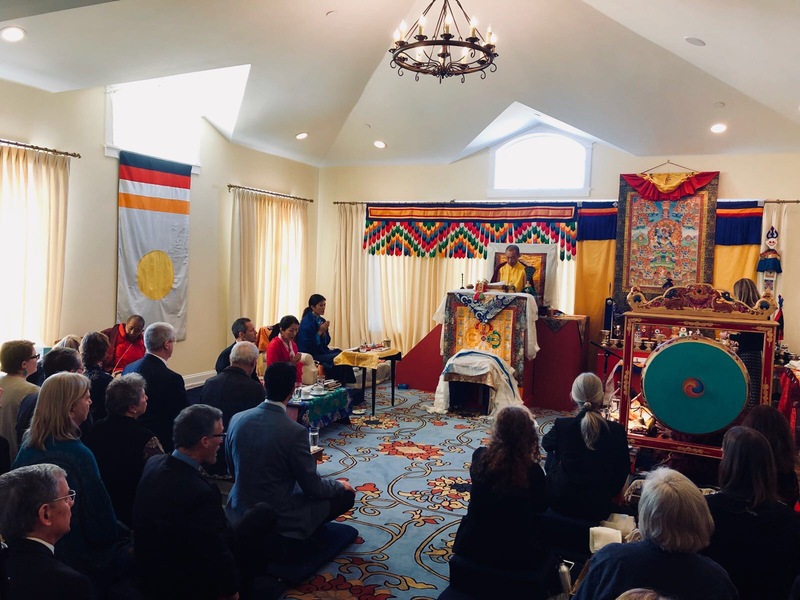 Also attending were the Sakyong’s mother Lady Konchok Palden; Minister Mitchell Levy; the Sakyong Wangmo’s sister Semo Palmo Ripa and her husband, Mr. Alan Goldstein; several Shambhala ministers, acharyas, and patrons; and other gentle and brave members of the community. The Sakyong was assisted by Lama Pema Gyaltsen, the husband of Lady Konchok, who oversaw the ritual and was umdze, or chant leader; and Lama Gyurme Dorje who guided the large group of chöpöns, or shrine servers, tasked with creating the shrines and offerings for the two days of intensive practice. Lama Pema Gyaltsen’s deep voice filled the room and found a beautiful counterpoint in the voices of the Sakyong Wangmo and Semo Palmo Ripa, who practiced with the Sakyong and lamas in Tibetan throughout the event. The atmosphere at the Kalapa Court was remarkable for both the powerful atmosphere of each puja and the feeling of warmth and hospitality, a reflection of the Sakyong Wangmo’s care and pleasure in hosting the Sakyong’s practice at the family’s residence. Guests at the puja remarked at how much the pujas have become a part of the community in the four years since the Sakyong began to do them publicly. Throughout the weekend the Sakyong and others received messages from people around the world who were practicing along with the Sakyong in their homes and centres. The most poignant aspect of the pujas was that they were practices especially for others. There was a genuine feeling of softness and compassion permeating the two days of the retreat. This was most evident during the reading of the names of the people and projects for whom practice requests were submitted. These requests came from people in more than forty countries, both places with Shambhala centres and those without, like Vietnam and Afghanistan. The Sakyong received his own copy of the list of practice requests and listened intently during the reading of the names of the recipients. One could not help but feel in tune with both the community and the world’s difficulties and as well as with the power of kindness to overcome obstacles and enrich the Earth. The pujas concluded with a feast on Sunday night. During a brief talk, the Sakyong commented on the quality of everyone in the community worldwide participating in the pujas and connecting with their intention and heart. He said, “What we are being asked to do is think bigger, to hold more. When the world wants to shrink and divide, we are being asked to open up more. That is something we can do personally and as a community.” May the blessings of the Sakyong’s pujas thoroughly penetrate our community and the world, and may all beings know the power of gentleness and bravery in these difficult times. Walker Blaine is Master of Liturgies to Sakyong Mipham Rinpoche and a Herald of the Kalapa Court. He has been part of the Shambhala community for more than 30 years. Walker’s ebook, The Great River of Blessings, an account of the Rinchen Terdzö received by the Sakyong Mipham Rinpoche in the winter of 2008-2009, can be downloaded at the Sakyong Foundation. His two CDs of Buddhist music can be sampled on iTunes. In 2016 he premiered a five-act Shambhala comedy, Norbu and the Mystery of the Missing Ratna, in Halifax, and is now writing a book about pilgrimage. He lives with his wife Patricia and their son Griffin Arrow, in Nova Scotia.